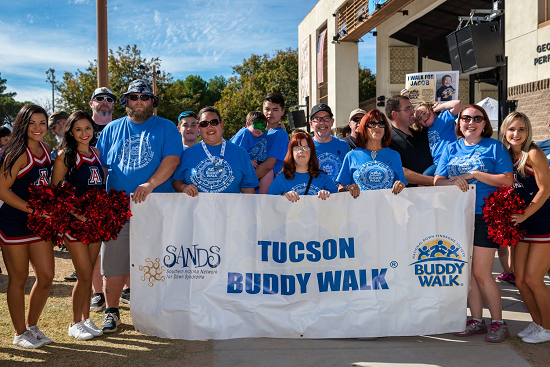 While all of the ds-connex partners have the same objective (to raise awareness and funding in their communities to support their missions), each Down syndrome fundraising event is unique. They may share the same basic elements, but there are always details that make the events different. A trend that we noticed during the 2017 walk season was the presence of celebrity guests. 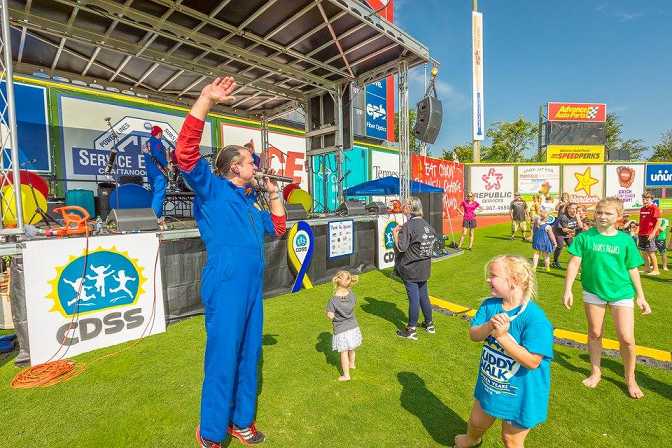 Several of the ds-connex partners invited cast members from A&E’s Born This Way to attend their walk events, and another partner invited The Imagination Movers to their event. We were excited to learn more about our partners’ experiences, and hope their insight will serve to inspire others to extend an invitation to a celebrity guest. On Saturday, October 28th, the Rio Grande Valley Down Syndrome Association held their annual Step Up for Down Syndrome Awareness Walk, and because they were celebrating their fifth walk, they decided that they wanted to “do something BIG.” They invited Megan Bomgaars of A&E’s award-winning series, Born This Way, as their Grand Marshal. The event coordinators love Megan’s speech, “Don’t Limit Me,” and they decided that the theme of their walk would be “Don’t Limit Us.” In early October, Megan filmed a promo for the event, which was posted on the RGVDSA Facebook page, and it was viewed almost 9,000 times. What a terrific way to build awareness in their community for the event! This video post also served as a reminder for people to register before the deadline to receive a t-shirt. The event coordinators really took advantage of this post’s potential to reach a large number of participants in their community to deliver an important registration reminder. In addition to the video promo, Megan agreed to participate in a Q&A session the night before the walk. This was important to the walk committee because they wanted their organization’s members to have the opportunity to spend time with Megan. The event was free of charge to the RGVDSA members, and gave them the opportunity to hear Megan speak and answer their questions away from the noise and excitement of the walk event. However, RGVDSA also invited the public to hear their celebrity guest speak, and charged them $10 to attend the private event. These are great examples of the impact having a celebrity guest could make on your event, and a creative way to partner with your guest to build awareness and excitement around the event. 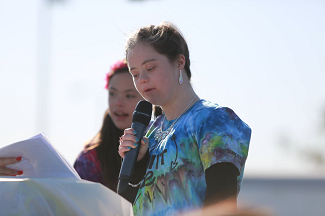 You can watch Megan’s speech at the RGVDSA Step Up for Down Syndrome Awareness Walk here. The 2017 Atlanta Buddy Walk® was scheduled to take place on October 8, 2017, but had to be cancelled due to the threat of a hurricane. The Down Syndrome Association of Atlanta had looked forward to hosting Sean McElwee as their celebrity guest this year, and they were very disappointed that the weather kept them from doing so. Because there were additional travel costs to rebook his appearance, the DSAA decided to alter the weekend’s agenda so that they could still enjoy Sean’s company. The DSAA board was able to host Sean for lunch and a trip to the local aquarium, and they were also able to coordinate a small gathering with 10-15 families. DSAA Executive Director Sheryl Arno was grateful to Sean and his family for their flexibility due to the unfortunate weather-related change of plans, but she would advise other organizations to remember that there may be additional costs to rebook at a later date. Hosting a celebrity guest at a fundraising event certainly adds cost and time to your planning efforts, but the benefit of their presence can outweigh those additional obligations. Not only can you raise more awareness of your event in your community, which can lead to increased donations, but you can also enhance your participants’ experiences as they interact with your guests. From what we can tell, these experiences are well worth the extra commitments. Event Coordinators – If you enjoyed this post, please check out the rest of our Event Coordinator Tip series. 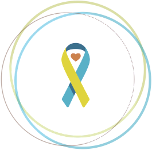 We feature event tips from around the country in an effort to share ideas and help build our Down syndrome community.